The Mazda stand at next month’s Frankfurt International Motor Show (IAA) will exhibit the new Mazda CX-7, featuring Mazda’s new ‘family face’ as seen on Mazda6 and Mazda3. 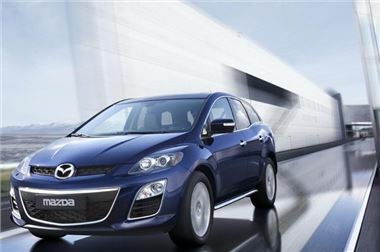 Also offering a bolder stance, the new Mazda CX-7 is powered by a high-output diesel engine. Under the bonnet, the clean-running and highly efficient MZR-CD 2.2-litre turbo diesel engine will offer customers eco-friendly performance twinned with a sporty drive already familiar to the current model. New Mazda CX-7 complies with Euro Stage V emissions regulations, despite being a roomy SUV, achieving a significant reduction in fuel consumption and CO2 emissions. New Mazda CX-7 will provide a greater level of torque lower in the rev range, with maximum power also available lower down. Mazda CX-7 debuts as the first Japanese passenger car to have a diesel engine fitted with a Selective Catalytic Reduction (SCR) system, which cuts NOx emissions by 40 percent. This technology will be offered exclusively to European customers in the new diesel version of the new Mazda CX-7 sports crossover SUV, when it goes on sale in October this year. Thanks to the compact design of the SCR system, the Mazda CX-7 Diesel offers users the same 455 litres of luggage space (VDA) as the previous gasoline engine version, and it is user-friendly. Refills of the AdBlue® liquid to the SCR system are required only during scheduled maintenance. Joining the clean-running new Mazda CX-7 diesel in Frankfurt will be a host of other environmental technologies currently making Mazda’s European line-up greener than ever before – including Mazda’s fuel-saving i-stop system, and rotary hydrogen powertrain technology. Mazda’s press conference will be held in Hall 3.1, Stand A7, on 15 September, at 12:45 local time.